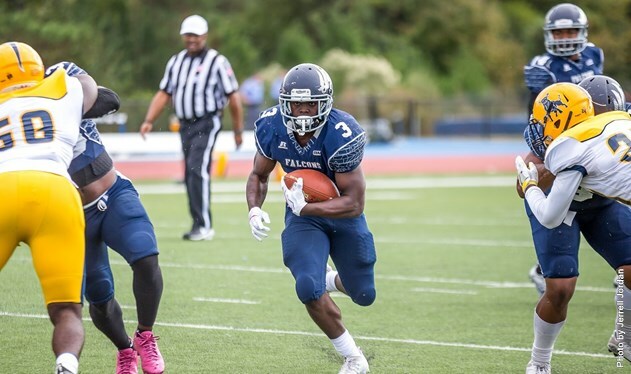 RALEIGH, N.C. — Saint Augustine’s University released its 2018 football schedule Wednesday, highlighted by games against archrival Shaw University, defending CIAA champion Virginia State University and Division I North Carolina Central University. In 2017, the Falcons were 5-5 overall and 5-2 in the CIAA. They tied for the best conference mark in the Southern Division, a feat accomplished by the Falcons for the first time in recent memory. This season, the Falcons open at Jacksonville (Sept. 1) and at North Carolina Central (Sept. 8) before hosting Virginia State (Sept. 15) and Bowie State (Sept. 22). The next three games are on the road as the Falcons visit Elizabeth City State University (Sept. 29), Livingstone College (Oct. 6) and Winston-Salem State (Oct. 13). Fayetteville State visits the Falcons on Homecoming Day (Oct. 20). The Falcons wrap up the regular season at Johnson C. Smith University (Oct. 27) and at home against Shaw (Nov. 3) in the third edition of the Raleigh Classic. Last season, the Falcons wrestled the trophy away from the Bears in a 31-14 victory. The CIAA Championship Game (Nov. 10) will be held in Salem, Va., for the third straight season. Sept. 1 at Jacksonville Jacksonville, FL 1 p.m.
Sept. 8 at North Carolina Central Durham, NC 6 p.m.
SEPT. 15 VIRGINIA STATE RALEIGH, N.C. 1 P.M.
SEPT. 22 BOWIE STATE* RALEIGH, N.C. 1 P.M.
Oct. 13 at Winston-Salem State* Winston-Salem, NC 1:30 p.m.
OCT. 20 FAYETTEVILLE STATE*# RALEIGH, N.C. 1 P.M.
Oct. 27 at Johnson C. Smith* Charlotte, NC 1 p.m.
NOV. 3 SHAW* RALEIGH, N.C. 1 P.M. This schedule is rough. Probably going to start the season 0-4. At least SAU gets the conference big dogs at home.